We have a rich history in this parish - of faith, of hope, of sharing. If you have any photographs or other items documenting parish events, it would be wonderful to include these on our web site. Doing so would honour St. Clement's family of faith and also witness to God's grace active in our lives. Can you help? All photographs and similar articles would be scanned at the Parish Office and soon returned. We hope to hear from you – and "Thank you!" 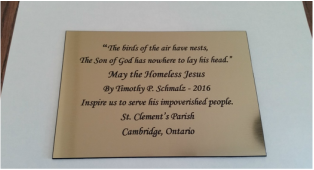 An image of the prayerful plaque installed upon Homeless Jesus' bench today. Grateful thanks to those behind this commemoration and the person who shared this photo. *For an closer look, click FROM the PASTOR'S DESK and see the July 17th message.